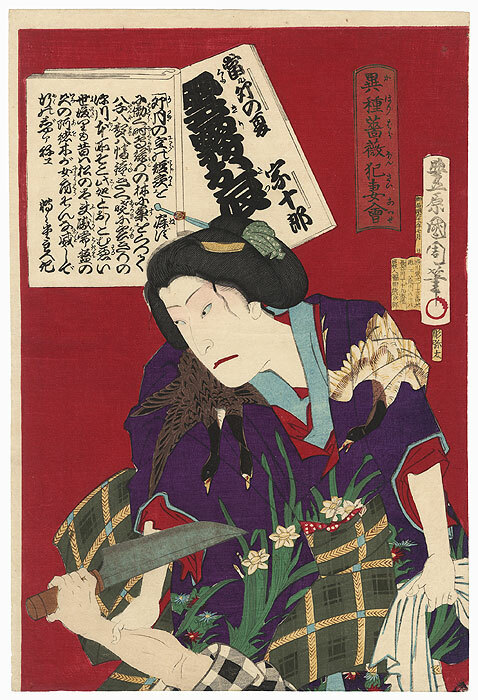 Comments - Intriguing kabuki scene of a beauty calmly twisting the wrist of an attacker with a knife, forcing the assailant to the ground before her. She stares off to the side with a tight-lipped frown as if lost in thought, a loose wisp of hair framing her face. 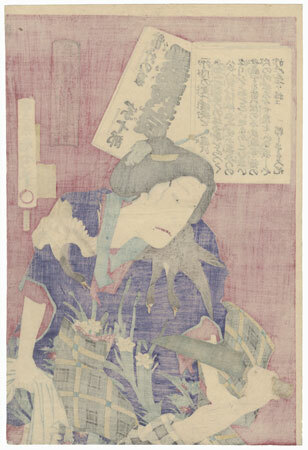 Her purple kimono features descending geese and narcissuses, worn over a red under robe and tied with a plaid obi, a white cloth in her other hand. At inset at upper left in the form of two books features text. A vibrantly colored design with fine detail in the hair and metallic pigment that has oxidized to a dark tone on the blade of the knife. Condition - This print with excellent color and detail as shown. A few creases, a couple small spots. Please see photos for details. Good overall. If you are a new bidder, please read the Rules and Guidelines page before bidding. Fuji Arts is the highest volume Japanese woodblock print retailer in the world. We post and sell prints 365 days a year in our fast-paced Internet auction, "buy it now", and fixed price formats. We are dedicated to outstanding value and excellent service with a smile! 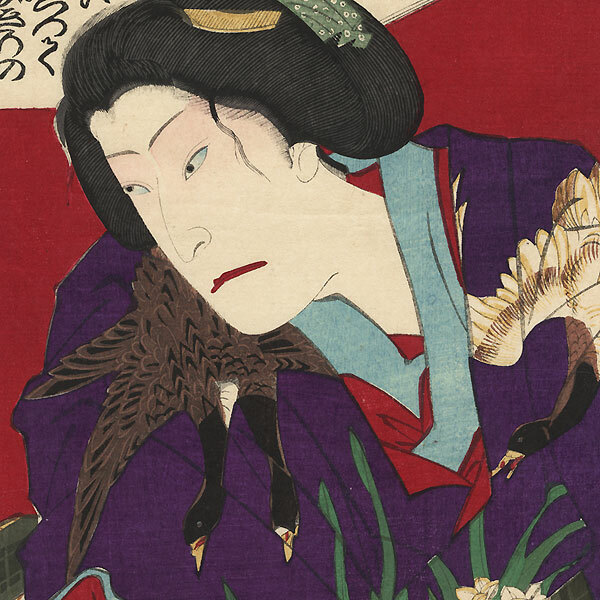 So sit back and explore over 200 years of Japanese woodblock prints. You've come to a special place, you're at Fuji Arts! Stay updated with what's happening at Fuji Arts! © COPYRIGHT 2019 FUJI ARTS INC. ALL RIGHTS RESERVED.